Live Industrial presents the WF20 fully automatic case formers that raise the bar for ease of use, performance, case forming quality and customer value. Featuring a case squaring system and Pin & Dome case opening system that together ensure accurate forming throughout the process, WF20 fully automatic case formers also allow easy handling of common imperfections found in corrugated boxes that can otherwise impact efficiency and quality. The Pin & Dome technology allows vacuum-free case opening wherein each case is mechanically captured and positively squared with precision and reliability. 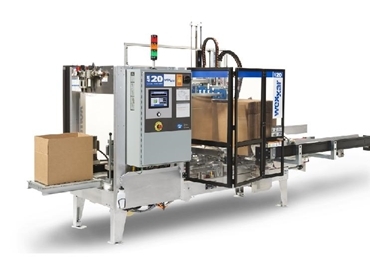 Built for sustained high speed tape applications, these operator-friendly packaging machines can handle highly demanding packaging requirements. The control panel features a user-friendly touch screen to control and monitor all systems. The tilt-out tape head in the WF20 fully automatic case formers minimises downtime with the easily accessed bottom tape head for fast tape changes. The tilt-out feature is exclusive to DEKKA tape heads. A colour-coded pictorial guide and easy tools-free adjustments provide for convenient setup and quick changeover in minutes. Bi-lingual instructions are also available. The WF20 fully automatic case formers can be integrated with BEL 290 case sealers to create a complete solution.